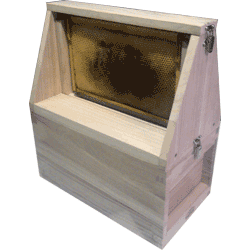 Mobile Observation Hive including British National 6 Frame Hive with Standard Deep Box and Feeder. This is glazed with tough perspex for safety. The sheets can be easily removed. The base is bee spaced and fitted with a queen excluder. Easy to use toggle catches securely attach all components for transport. Varroa Mesh Floor including 2 way entrance block and sliding inspection tray. The floor and a separate entrance cover are screwed to the brood box. These are designed for the temporary observation and display of honey bees. When not in use the nucleus hive is managed as usual in the apiary. When observation or display is required, place the queen and the frame she is on into the observation top and replace this frame with the frame feeder. Use a weak 25% sugar syrup so the bees can dilute their honey stores. 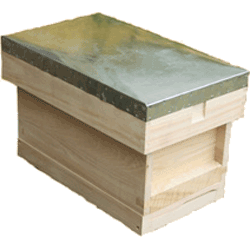 The whole unit can be carried and transported, it is advised to use a hive strap when moving any box of bees. A small colony is not harmed by temporary confinement as long as they have food stores so limit use to a day or two. This is a good way to make use of a retired queen bee.